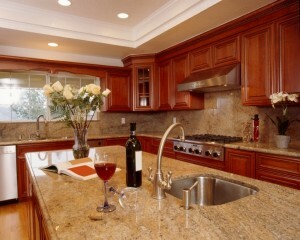 Granite counterparts are becoming one of the more popular choices. They are hardwearing and cannot be damaged very easily. They can also have a positive effect on the resale value of your home. Granite worktops require very little in the way of maintenance; a sealant applied once a year and regular cleaning should be sufficient. Choosing the right type of granite worktop is a little more difficult. There are a range of different sizes, patterns and colors and it is important to get one that fits in with your kitchen decoration. The color is the most important factor. It has to match your walls, cabinets and furniture. You can get hold of samples that you can test in your kitchen to see what works best but, if you are finding it difficult to choose, stick with neutral colors. If you opt for one of the “in-colors” you might find that, a little way down the line, it has gone out of fashion and it no longer looks very nice. Make sure the color you choose blends in with your kitchen, i.e. if you have a dark kitchen go for a lighter color. Something else you need to think about is the cost. This is going to depend on the pattern you choose and the quality. Try to set yourself a budget first, as this will make sure you are only looking at a specific range of tops that you can afford. Compare prices between stores; you might find the same one a bit cheaper at a store down the road. Something else that may affect the price is the manufacturer. Some may be able to offer better deals than others because they may have bought in the material at cheaper price. You could go to the manufacturer direct; they are more likely to have a wider range of choice and better prices. Granite worktops are made from material that comes from all over the world; the country of origin will play a determining factor in the ultimate price you will pay for the worktop. Think about how thick you want your granite worktop to be. There are normally 2 to choose from – ¾ and 1¼ inch. Obviously the thicker size will be more expensive. Much will depend upon where it is being located and what is going to be holding it up. Thicker ones will require a lot more support underneath, while thinner ones will need more support under the overhangs. You can choose the type of edging that you want on your worktop; choose carefully because it will have an effect on the look of your kitchen. A few that you will come across are bullnose, beveled, chiseled and rolled – this is the most popular choice. You must choose your worktop in person – looking at pictures will not give you a true idea of what the finished product looks like and colors can look very different between a picture and the real thing. The author of this article is Arian. He is a regular blogger writing on Home Improvment Projects and an expert in Granite Countertops and Kitchen Remodeling NJ.